Open up the world of wine and food! To thank you for your loyalty, we’ve put together an exciting range of Member benefits that allows you to take your enjoyment of wine to delicious new heights! – and thank you for choosing Wine Selectors! 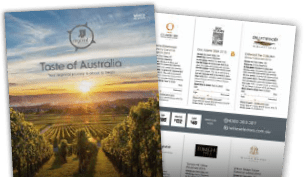 Wine Selectors cellar door release members get exclusive access to amazing deals in the categories of Drink, Eat, Stay and Play across Australia's stunning wine regions! Check out the incredible offers today! Featuring the colourful personalities behind your wine, chefs to inspire, recipes to impress and awe-inspiring travel features, Selector magazine is the perfect complement to your wine experience. As a Member, you’ll receive up to 6 free copies in your wine deliveries, valued at $8.50 every edition. 2019 Calendar Collection: Chef + The Cellar! As a Wine Selectors Member, each year you will receive a copy of our exclusive Food and Wine Matching Calendar valued at $19.95 RRP. Happy birthday to you: enjoy a special birthday treat on us! Everyone deserves a special treat on their birthday! To help you celebrate, you’ll receive a $30 Wine Selectors e-voucher each year to spend during your birthday month. You can select from any of our Special Offers and choose something to make your day absolutely delicious. We’d love to meet you and introduce you to like-minded wine-lovers at our Member events. Our events calendar is always being updated so watch out for upcoming opportunities to meet great Australian winemakers, discover exciting new wines and dine out with celebrity chefs. There is always something happening in the wine industry that sparks debate, peaks our interest or is just plain entertaining – and we share all of our stories, insights and regional and varietal features with you in our monthly eNewsletter.